When it comes to winning campaigns, nothing beats getting an understanding of how social movements work…there are some great resources that people can dip into. As episode 2 of ChangeMakers explains, in the Northern Rivers, a bunch of us were familiar with social movement theory, especially with Bill Moyer and his work, and had on-ground experience in campaigns. This was invaluable. But there’s another type of knowledge that’s useful in growing social movements – and that’s an understanding of how human systems work. This knowledge is sometimes called complexity theory, but don’t get dismayed by that name! It’s a way of understanding practical steps to get things happening on a larger scale. The basic concept is that natural and human systems are different from machines like your car. A car is predictable…when you press down on the accelerator; you’ll gain speed in a linear fashion. Your car is not creative. Your alternator and drive shaft don’t suddenly get together and invent a whole new way of driving! Fortunately, human systems are capable of sudden, non-linear change when social movements get going. Like any natural system, tipping points are reached and suddenly your social movement starts behaving in an entirely new way. In the Northern Rivers we went through several of these tipping points as our movement ramped up, with many thousands of people involved. Our alliance maximised self-organisation. With 18 action groups and 147 self-declared Gasfield Free communities, creativity abounded. It was a wild ride. When I threw myself into the Northern Rivers campaign I’d just spent 4 years exploring how complexity concepts can be applied to social change. Here are some practical examples of how I found this knowledge useful in the hurly-burly of the Northern Rivers campaign. Gasfield Free? Hands shot up for YES. Then we asked if they’d like to give everyone in the community their say, by visiting every household, and they organised in survey teams. 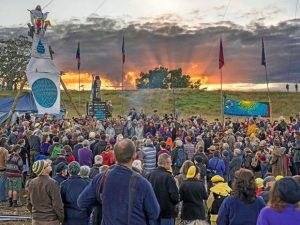 When the results came in, 99.3% of 432 respondents said YES, and we declared our district Gasfield Free in a defiant, joyful ceremony captured in this video. Complexity theory helps explain how the Gasfield Free Community strategy spread like wildfire, engaging citizens across political affiliations, mobilised entire communities, and created a sense of entitlement to live Gasfield Free. This process took the defiance embodied in the individual Lock The Gate sign to the level of communal resistance. Victorian campaigners used this process as part of their strong campaign to get an onshore gas ban in that state. 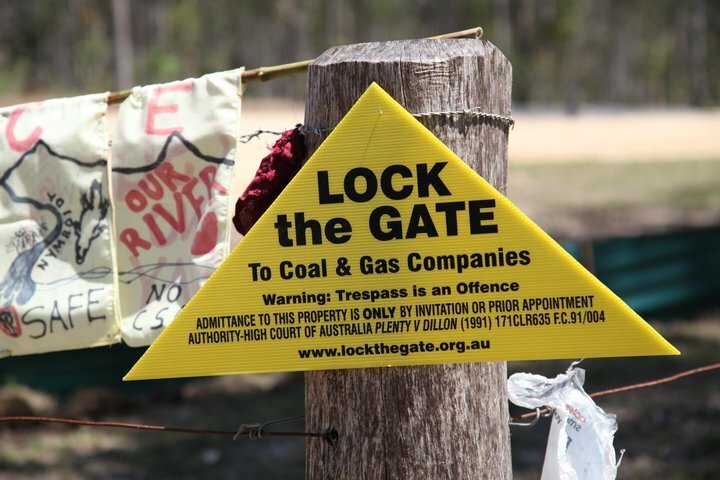 Around Australia, there are now 450 Gasfield Free, or Coal Free communities. To replicate virally, it needed self-organisation. That won’t occur with tight constraints (many top-down rules). We shared the process in such a way as to empower communities to organise their own surveys and declaration ceremonies. But the converse is also true. Self-organisation won’t occur with zero constraints. We provided some minimum guidelines for a comprehensive survey with reliable data, to give traction to the campaign. For instance, we learnt that the survey needed to be done face to face, not by people posting notes in letterboxes. We strongly nudged campaigners follow this template as it was an important element for engaging each community. If you’d like to understand this concept of constraints, check out the section on Minimum Specifications in Edgeware, a useful, accessible introduction to complexity concepts. In my exploration of complexity concepts, one framework stands out. This is the Cynefin Framework developed by Dave Snowden and others. This is all about knowing your context and choosing actions to suit the situation. When in the complex zone, says Snowden, run a series of probes or experiments – amplify the stuff that works, and shut down elements that are not useful. This is exactly how we developed Gasfield Free Communities, through action learning. We started a working group that met one a fortnight in Lismore, a kind of social learning laboratory… an incubator. 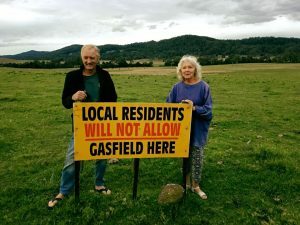 Through many iterations, we learnt what helps and what hinders this process in communities – this was the space that tested, tried and spread the survey process that so successfully built community support for Gasfield Free. If you’d like to get a taste of Cynefin, watch How to Organise a Children’s Party, or read an article on how we applied it in Health Promotion, prior to my involvement in the campaign. Complexity concepts are applied wherever humans interact: organisations, corporations, and governance. There’s some very interesting writing on its relevance in Development Aid. Throughout history, great campaigners have instinctively worked with the grain of complex systems. The good thing about this moment in time is that we now have a framework, a language. The 21st century is all about networks.. A new paradigm is emerging that understands human systems as adaptive and complex. If we want to grow a movement or get bang-for-buck in an organization, understanding these dynamics is very, very helpful. Above all, we need to understand self-organisation, the special sauce that liberates collective intelligence.